The growing popularity of using succulents — here and abroad — for decorative plant arrangements is resulting in what state officials are calling a “rising poaching trend on the North Coast,” including the the discovery of an alleged international poaching ring. 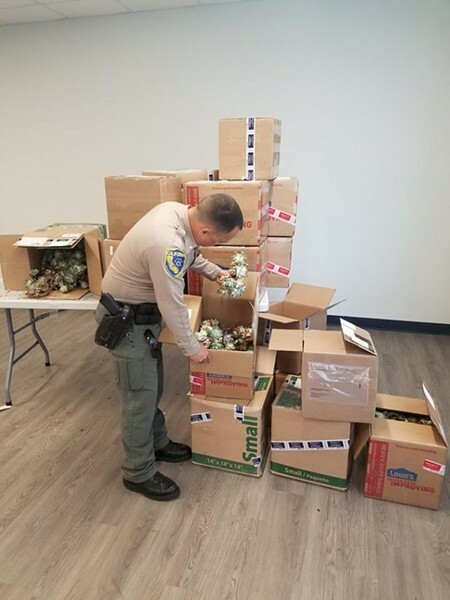 Wildlife officers intercepted and seized 1,334 of the plants in boxes being prepared for overseas shipping on Wednesday and found another 1,000 dudleya after serving a search warrant on the suspects' hotel room. The three are now facing a series of charges, including the illegal taking of the plants and felony conspiracy, according to a CDFW release. The generally hearty and drought-resistant plants can bring $40 to $50 apiece on the Asian market — upwards of $100,000 for what was discovered this week. Coupled with the environmental damage the poaching can cause, many of California’s dudleya varieties are at risk of going extinct, officials said. "We have seen a remarkable amount of concern over this from botanists and the public alike," David Bess, CDFW deputy director and chief of law enforcement, said in the release. "A public tip started this investigation and ultimately uncovered an international conspiracy to poach Dudleya succulents and ship them overseas for profit." California Department of Fish and Wildlife (CDFW) officers have made another arrest this week in their ongoing battle against a rising poaching trend on the north coast of northern California with international connections. 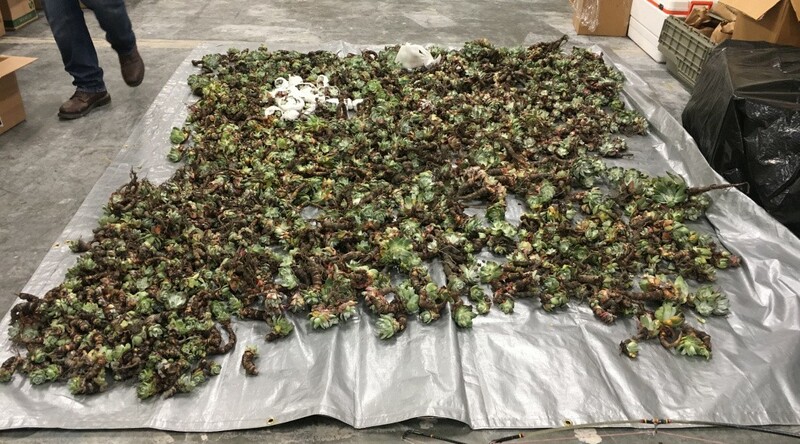 CDFW arrested Taehun Kim, 52, and Taeyun Kim, 46, both of Korea, and Liu Fengxia, 37, of China for poaching over 2,300 Dudleya succulent plants near Trinidad in Humboldt County. Charges include illegal take of the plants and felony conspiracy, among others. Poachers profit financially from the illegal take of Dudleya by stripping plants from sea cliffs and shipping them overseas to other countries, including Korea, China and Japan, where they are prized by some for decorative purposes. On April 4, wildlife officers intercepted and seized 1,334 of the plants in boxes on their way to be shipped overseas. An additional 1,000 Dudleya were found in the suspects' hotel room during the service of the search warrant. The overseas market value of the plants is between $40 to $50 per plant, resulting in a conservative value estimate of over $90,000. The removal of Dudleya can result in environmental degradation of habitat and a destabilization of bluffs and cliffs on the coastline. Illegal harvesting is also alarming because California hosts a number of Dudleya species and subspecies that are rare or at risk of extinction. CDFW enforcement initially identified this trend earlier this year, in part, after determining that a man was shipping Dudleya out of a Mendocino post office to China. In recent months near Point Arena, Mendocino County, wildlife officers cited three individuals for a series of misdemeanor violations including illegal take and trespassing. The charges were elevated by the Mendocino District Attorney to felony conspiracy and grand theft, based upon the value of stolen plants. On Jan. 29, one man was apprehended with approximately 50 succulents, and on March 6, two men were cited after being apprehended with 1,400 succulents. The individual in the January incident pleaded guilty to the illegal take of plants and received a sentence that included three years of probation, a $5,000 fine and 240 hours of community service. The March case is pending. "We have seen a remarkable amount of concern over this from botanists and the public alike," said David Bess, CDFW Deputy Director and Chief of Law Enforcement. "A public tip started this investigation and ultimately uncovered an international conspiracy to poach Dudleya succulents and ship them overseas for profit. A critical part of the Department's mission is to protect and manage California's diverse fish, wildlife and plant resources, and the habitats upon which they depend, for their ecological values and for their use and enjoyment by the public." Law enforcement personnel from the U.S. Postal Service, U.S. Fish and Wildlife Service and East Bay Regional Parks, in addition to representatives of the California Native Plant Society (CNPS), U.C. Santa Cruz Botany Department and local citizens, assisted with the investigation. CDFW personnel have replanted the seized succulents in the areas where taken whenever possible with assistance from CNPS and U.C. Santa Cruz botany experts. Anyone who believes they are witness to unlawful poaching or pollution activity is encouraged to call CalTIP, CDFW's confidential secret witness program, at (888) 334-2258 or send a text to tip411. Both methods allow the public to provide wildlife officers with factual information to assist with investigations. Callers may remain anonymous, if desired, and a reward can result from successful capture and prosecution.